Vanguard Founder: "A Crisis of Ethic Proportions"
John C. Bogle, a Princeton graduate, founded The Vanguard Group in 1975. Vanguard founder John C. Bogle points the blame for the credit crisis at more than just easy credit, cavalier risk attitudes and complex derivatives. A breakdown in traditional ethical standards and managerial self-interest over company-interest are also to blame, says Bogle. John C. Bogle, the founder and former chief executive of The Vanguard Group, one of the world's largest investment management firms with approximately $1.3 trillion in assets, has weighed in with his views of the current financial crisis in a profound op-ed published in today's Wall Street Journal. In his piece, Bogle, who started the concept of index fund investing, loops commerce and business in with the financial world as having experienced what he termed, "a broad deterioration in traditional ethical standards." Citing Adam Smith's "invisible hand" in which the combined forces of self interest, open markets and competition represent the basis of capitalism, Bogle reaffirms its importance in creating prosperity and well-being but then concedes that self-interest "got out of hand," as he put it. "It [self-interest] created a bottom-line society in which success is measured in monetary terms. Dollars became the coin of the new realm. 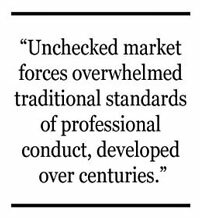 Unchecked market forces overwhelmed traditional standards of professional conduct, developed over centuries." Bogle then touches on the prevailing notion among a growing number in business today that one has to cheat to succeed: "The result is a shift from moral absolutism to moral relativism. We've moved from a society in which 'there are some things that one simply does not do' to one in which 'if everyone else is doing it, I can too.'" He then takes the professional ranks to task for placing money and expediency before performance and accountability: "The driving force of any profession includes not only the special knowledge, skills and standards that it demands, but the duty to serve responsibly, selflessly and wisely, and to establish an inherently ethical relationship between professionals and society." "The old notion of trusting and being trusted...came to be seen as a quaint relic of an era long gone," Bogle writes. Another major reason for the crisis, according to Bogle, who served as Chairman of The Vanguard Group from 1975 to 1999, is an apparent conflict of interest that has gradually taken shape in large mega corporations between company management and its shareholders - the owners of the company. "The larger cause [of the current crisis] was our failure to recognize the sea change in the nature of capitalism that was occurring right before our eyes. That change was the growth of giant business corporations and giant financial institutions controlled not by their owners in the 'ownership society' of yore, but by agents of the owners, which created an 'agency society.'" Bogle adds, "the managers of our public corporations came to place their interests ahead of the interests of their company's owners. Our money manager agents - who in the U.S. now hold 75% of all shares of public companies - blithely accepted the change." "They fostered the crisis with superficial security analysis and research and by ignoring corporate governance issues. They also traded stocks at an unprecedented rate, engaging in a dangerous spree of speculation." "The malfeasance and misjudgments by our corporate, financial and government leaders, declining ethical standards, and the failure of our new agency society reflect a failure of capitalism," writes Bogle. He then reinforces his point by drawing on a quote from Alan Greenspan who testified before Congress in October of last year that the entire functioning structure that "defines how the world works" was flawed. The solution, according to Bogle, in countering this new form of capitalism that Bogle says has emerged is to "work to establish a 'fiduciary society' where manager/agents entrusted with managing other people's money are required - by federal statute - to place front and center the interests of the owners they are duty-bound to serve." He closes by writing that, "the focus needs to be on long-term investment (rather than short-term speculation), appropriate due diligence in security selection, and ensuring that corporations are run in the interest of their owners.